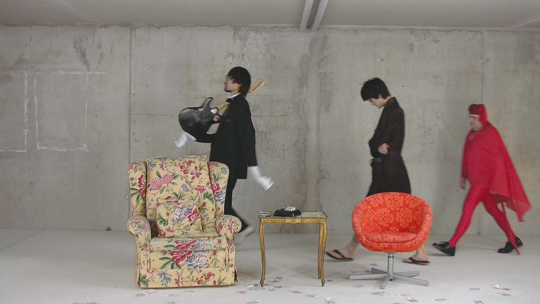 Jay Chung and Takeki Maeda's practice is characterized by performance, which often involves weighty unsettling humour. Concerned by popular and digital culture, art speculation and self-criticism they play with their presence and retreat, creating some emptiness which is conducive to reflexion. They are known for their definition of new artistic territories and the chosen format is always extremely varied. There is a certain anthropological aspect to their approach, a precise gaze, attentive as they are to the context in which their new work articulates itself. Jay Chung and Takeki Maeda’s practice is characterized by performance, which often involves weighty unsettling humour. Concerned by popular and digital culture, art speculation and self-criticism they play with their presence and retreat, creating some emptiness which is conducive to reflexion. They are known for their definition of new artistic territories and the chosen format is always extremely varied. There is a certain anthropological aspect to their approach, a precise gaze, attentive as they are to the context in which their new work articulates itself.